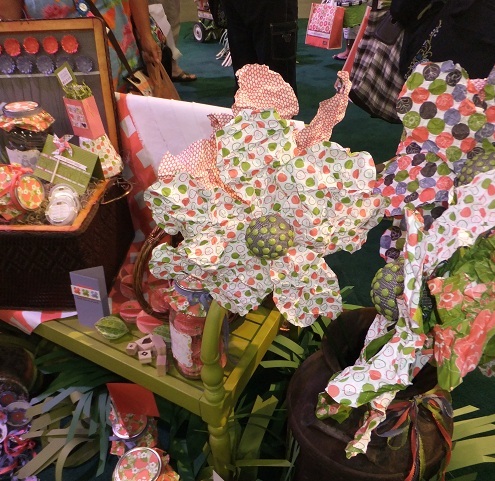 Check out the StampinUp convention highlight video and you can hear the convention theme song too. 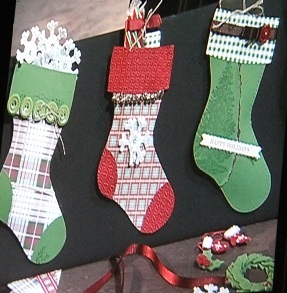 The song will inspire you to create and share the love of paper crafting. So get out your stamps and create something new! Here are our Make and take projects from SU convention in SLC Utah. Swapping at Convention happened everywhere you looked. Card swaps, 3Dswaps,tag swaps, page swaps, punch art swaps- you name it and it was swapped. Here are Cammies swaps she traded at convention. Sadly convention ended this afternoon on a high note and has both Cammie and I counting the days until Convention 2012. 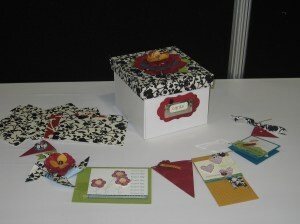 But even more inspired to go the extra mile and share StampinUp with friends and family so that we can earn an incentive trip to Figi in 2013. This convention truly changed us and helped us grow and find a purpose to share what we love. Convention was priceless and you can see for yourself how generous the SU was by the “loot” we received as demonstrators and convention attendees. 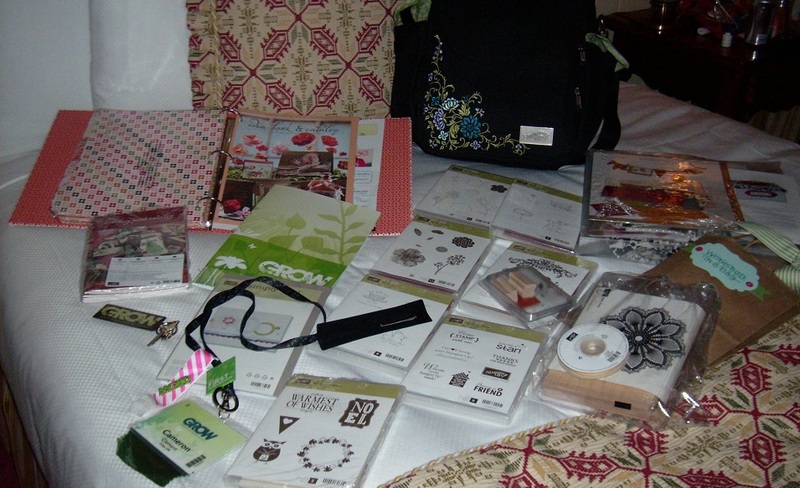 We received aconvention bag filled with beautiful 3 ring binder with IBC and coordinating dividers, 5 stamp sets from the IBC and an exclusive set for attending classes, a key ring, lanyard, pin,pen, 3 over the top make and take projects, classes, daily lunches and snacks, entertainment, and prize patrol. We also received 3 great prizes from prize patrol in the General session and Cammie and I both were lucky enough to have our wrist bands pulled for additional stamps from prize patrol. The intangibles were even more priceless! Here is a teaser from the display area in the convention gathering place. This DSP, Berry Blossom, was displayed wonderfully and now it is a must have item to add to my creative stash! 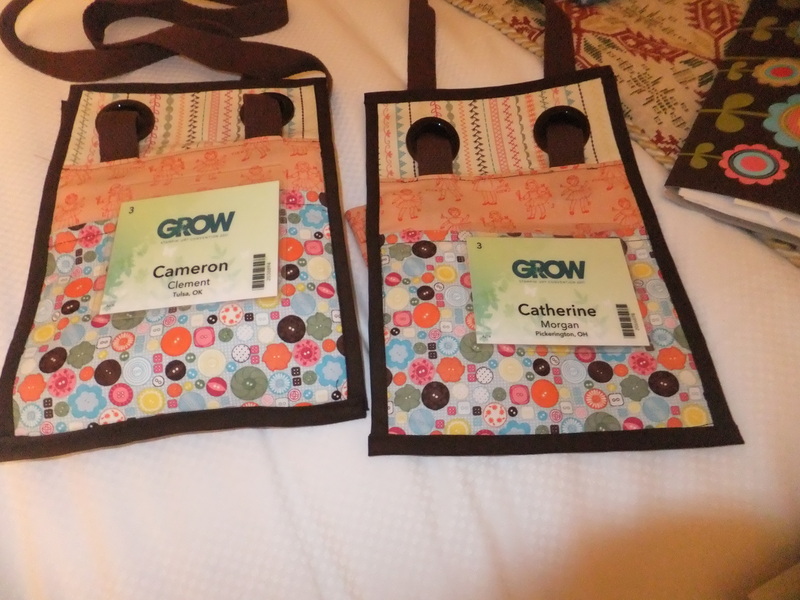 Cammie made our matching convention swap bags (and also our daily matching outfits) from Stampin Up fabric. These purses stopped traffic and were photographed from every angle. We even got Shelli Gardner to sign our custom swap purses. They are now priceless!